Ok, so about a week ago I decided to just start Googling how to learn to program. Ruby is a programming language that everyone says is “really easy” (I have a suspicion that my definition of “really easy” is quite different from those who say this) But, I think I’m going to start my programming adventures by learning Ruby. First, because of the “really easy” comments. I figure that even if it’s super hard, it has to be less hard than other languages that are not often described as “really easy”…SEE? I can think logically! I’m also wanting to learn this one because my husband knows it and likes it, so he will be a good person to ask questions to when I feel stuck. I found this super cool sounding thing called Rails for Zombies, where you learn to program by creating program like Twitter, but for zombies. Awesome, right? I like Zombies! So I clicked on it, and it told me that if I was unfamiliar with Ruby, I should do an online Ruby tutorial first, and suggested tryruby.org. I’m all for suggestions, so clicked over and started playing with it. Great! This sounded perfect, so I started to play with it, and it is fun! The mini-tutorial takes you through several basic concepts of programming, and introduces you to some terminology while giving you bits of code to try and see work in the prompt window (you don’t actually have to download or install anything to play with this). So…it’s a week later, and I don’t feel ready to move on from this “15 minute tutorial” It’s possible that I’m overthinking the point of the tutorial, but I’ve gone through it several times. While it is easy and guided, I don’t feel like I understand the WHY to what I see happening on the screen when I enter in commands. I think I’ll just keep doing it for the sheer purpose of practice, and see what I find to play with next. Now a note: So when I told my husband what I was doing, he looked at the tryruby.org tutorial and wholeheartedly approved. He also looked at the Rails for Zombies site that I intended to use, and cautioned me that I shouldn’t learn Rails until I understood Ruby…What??? I thought Ruby on Rails and Ruby were the same thing! They both have the word Ruby involved! He explained that Rails is a framework to use when writing the Ruby language. Thus, they work together, but are NOT the same thing. He said if I try to learn Rails before understanding Ruby, it would seem like magic, and that’s NOT what I want out of learning to code! I want to understand, not to be able to do magic. Lesson learned! I think this illustrates to power of using self-guided tutorials, but having a more knowledgeable peer to discuss with. Thanks Vygotsky, and Thanks husband! Now I need to find more people resources so I’m not just relying on the word of one man to learn stuff like this. ← Why Coding? Why Now? You should have a look at LOGO, the turtle graphics language. 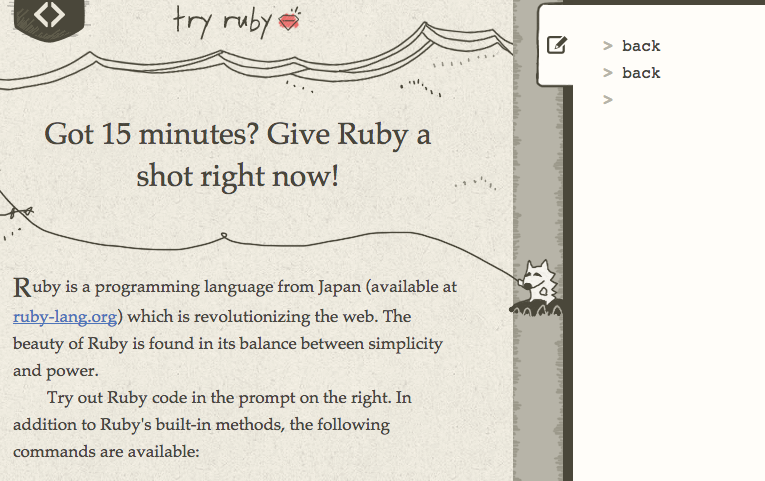 Here is a link to a very good site for this, with interactive action, like the ruby one that I just tried out. Awesome, I will! I have heard so many people refer to learning LOGO in the 80s, but I never did. This seems right up my alley. I like graphics AND turtles. Thanks! !